In relation to the previous post Beyond Luck: Be Inspired with PinoyExchange and Yugatech, an unexpected response was received through Twitter. See image below. My Twitter is actually connected to my blog through NetworkedBlogs. So each time a post is published through this blog, Twitter automatically tweets about it. I have no idea how Abe Olandres saw the tweet but his reply made me so excited like a star struck net citizen over a netizen icon. I didn’t even know about the reply until a few minutes ago. Good idea that I just recently edited my Twitter settings to send me an email notification every time someone replies to my tweets or retweets it. I received an email about the tweet earlier this morning but I only got to read about it through the email tonight. I replied of course although that’s not on the screenshot. 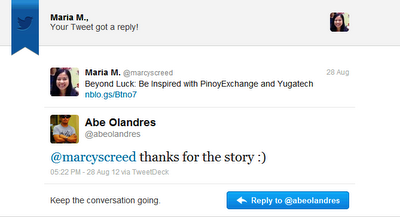 If you’re following @abeolandres, you can verify it. You can also check mine @marcyscreed. Why is there a need for me to share about the tweet? Well, aside from the star struck part, it’s as inspiring as what I wrote last night. A popular person like Mr. Oladres who is an inspiration to others remains humble despite what he has achieved. In fact, he actually interacts and communicates with aspiring web folks as evident in his Twitter account.